It’s been a little while since I’ve seen one of these deals pass through. Over at Amazon, on rare occasion, you’ll see Carl Martin pedals featured at crazy low prices. When this happens, they usually are gone very quick, so if this interests you in the slightest, I would jump on it ASAP. 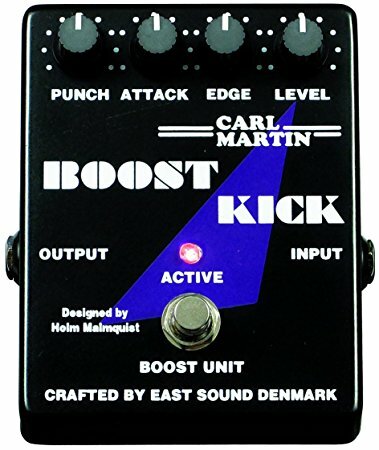 This time, the pedal featured, is the Carl Martin Boost Kick. The Boost Kick is boost that will deliver 12dB of boost, but what I like about this simple boost, is that there is a 3 band EQ section – Punch, Attack and Edge. Attack is midrange, and that is critical on a pedal like this to pop out of the mix, especially for leads. So, let’s talk about this deal! The Carl Martin Boost Kick has a MSRP of $238. You can usually see this available in the $160 range, but is currently on sale for an insane amount of $53.78 at Amazon and includes FREE shipping. We’re talking over $100 off the going rate for this pedal. As of right now, there are only 5 units in stock. Usually, when the unit counts gets to 1, the price will spike back up, so if you want it.. get it. This is a great time to you use your Amazon Gift Cards you got on Christmas! 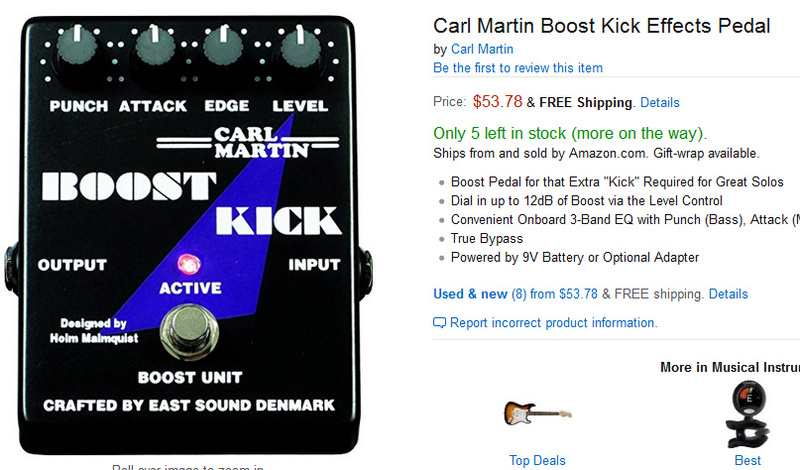 If you own the Carl Martin Boost Kick, let us know what you think of this pedal! Love to hear your thoughts. Please comment below! Great deal on the Carl Martin Boost Kick at Amazon Nice Deal on the MXR MC401 Boost / Line Driver on Amazon Great deal on the Carl Martin “The Fuzz” Good deal on the ModTone Clean Boost! $ 70.97 Prime – Only 4 left in stock – order soon. Bummer.. looks like they jacked it up? !